This week’s Vue Lighting Rig is less of a rig and more of a way of achieving a Christmas light effect. Looking at the Christmas lights in Liverpool I noticed several invisible Christmas trees. I’m sure these are popping up all over the country. 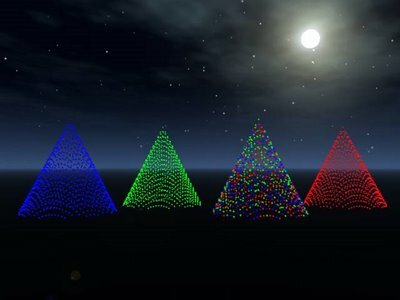 You see lights in the shape of a tree but no tree. I’ve made four EcoSystem materials that create a similar effect when applied to a cone. One each in red, green and blue with a three colour one too. I’ve tested them with Vue 6 Infinite.